Great books are worth the time. Back in college and grad school days, I knew several chemistry majors who, when they got a few weeks inside Organic Chem, suddenly felt like they were hopelessly sinking. You could read their worried expressions like pages in a story: I’m in the wrong major. I picked the worst career ever. I can’t do it, because I don’t get it. Same thing with the Pre-meds when Anatomy and Physiology hit them like a bus, and same thing again when Library Science wanna-bees opened their textbooks on MARC records. The content itself in these classes threatened to kick even the most determined and intelligent students the heck out of the discipline where they thought they’d always belonged. Many students were “weeded out” during these classes and other particularly challenging ones; the ones who made it through shivered with relief. And every now and then a student came out the other side the clear victor, making once-threatening ideas now serve their needs instead. 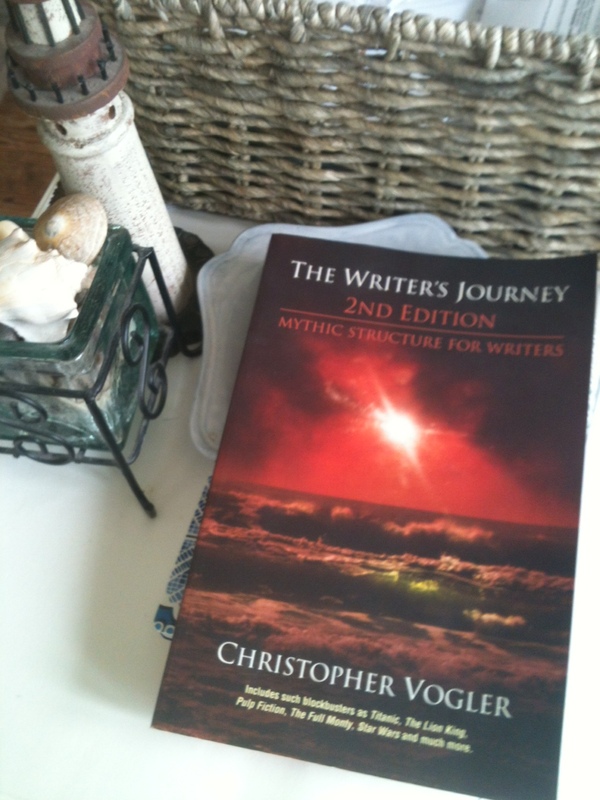 Christopher Vogler’s The Writer’s Journey: Mythic Structure for Writers has a similar effect on some storytellers. I watched it happen in grad school and I felt some of the panic myself: What? Huh? Who? Slow down. Maybe this writing thing isn’t for me after all. It’s not that the text is hard to read; it’s not at all, it’s easy reading. It’s clearly explained. It’s a friendly tone. The examples are all stories we know and love well. So what’s the problem? Maybe it has something to do with the basic premise: that all stories–every book you’ve ever read–are all really the same story. (At least, the good ones.) And that not only are all stories basically the same, but that your life and my life and pretty much every life ever lived or being lived or going to be lived is the same story too. Vogler’s book, pictured here, is a guide for writers. It’s a spin on the work of Joseph Campbell, myth theorist extraordinaire. Joseph Campbell’s ideas “run parallel” (Vogler’s phrase) to those of Carl Jung, a Swiss psychologist who discussed the role of archetypes in our real lives. Joseph Campbell wrote a book called The Hero with a Thousand Faces in which he analyzed both the archetypes themselves and the archetype-besprinkled path we all follow through life. (Stay with me.) And Vogler used Campbell’s ideas in his days as a writer and consultant for the movie-making industry, ultimately writing about this Hero’s Journey mythic structure in a seven-page how-to-use-it-well memo. He calls The Writer’s Journey a “descendant” of that memo, and describes how writers of stories can use Campbell’s ideas not only in their pages of fiction or their screenplays but also in their real lives as writers. Some students love literary analysis so much in high school that they become high school English teachers. As a teacher, when I read Vogler’s book, my reaction was “Well, yeah. Plot Triangle Diagram 101.” But as a would-be writer, this book blew me away, and lots of other writers in my fiction program too, and caused us to question the choice to devote a good portion of the rest of our lives to being writers. It’s overwhelming to think that every story–including the ones you haven’t even dreamed up yet!–are going to fall into this iconic, mythic structure that also parallels each and every life ever lived. Whew. Then, there were those who debated and I’m sure still debate the merits of Vogler’s ideas, saying it’s just a lengthy description of a formula, and why should anyone settle for thinking about plotline via formulaic means. I’m anti-formula too–unless it’s more of a map to the whole meaning and purpose of the quest that is life, which Vogler suggests the Hero’s Journey is. Chapters are devoted to each archetype and to each stage of the Journey, complete with many examples from great movies and books. By the time you’re done reading, you’ll never again watch so much as an episode of Blue’s Clues in the same way. And you might find yourself analyzing the journey you are on, thinking, “Oh, yeah, that ex-boyfriend. Definitely a shapeshifter.” Et cetera. It’s a great read. It’ll get your wheels turning down paths you may never have considered. But if you’re a fiction writer, it’s a little…daunting. Fascinating, but daunting. A writer may have to figure out how to best tame these ideas for his or her own use. Literature and language arts teacher, middle grade writer and reader. Contributing member of The Mixed-Up Files of Middle Grade Writers. Pitchwars 2017 MG mentor! Click "Teacher Resources" on the menu above for study guides and writing projects for popular MG novels. "Keeping It Real: Truth and Fiction in YA" Article in Many Genres, One Craft: Lessons in Writing Popular Fiction (Headline Books, 2011).